If you are a man who has been sexually abused in childhood or assaulted as an adult, or are a partner, family member or friend, know that information and support to live well is available here. We understand that men and their supporters can face some unique pressures and challenges. Get info and support to enhance your well-being, to better manage difficulties and build healthy relationships. This video, “No straight lines: We all benefit from maps of life’s territories”, highlights how we all benefit from maps of life’s territories. Maps help ground and orient us. Where we can become stuck and overwhelmed, maps can help us find our way. Maps help us to connect, share and draw upon the experience of those who have come before us. Read more about this video and painting. Listen to men’s stories of encouragement and support. Yes, it can be tough at times and take effort to keep going, but you are worth it. View our collection of videos of men talking about sexual abuse, or read some encouraging stories written by men. The full Final Report of the Royal Commission into Institutional Responses to Child Sexual Abuse is now available on our eLearning portal. The National Redress Scheme is now in effect, providing ongoing support to those affected by institutional childhood sexual abuse. Statistics are one way we can develop a picture of the extent of child sexual abuse or sexual assault in our community. Get the facts from our Sexual abuse statistics page, aiming to dispel Unhelpful myths about the sexual assault of men. The Bristlecone Project documentary film is a powerful and effective vehicle for raising awareness about men’s potential to reclaim healthy, meaningful lives after experiencing childhood sexual abuse. Read more about this documentary. Living Well have developed an eLearning portal consisting of free training manuals, resources and professional development articles for practitioners working with men who have experienced sexual abuse or sexual assault. 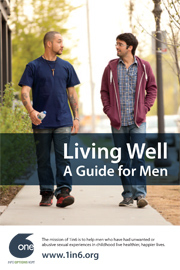 At Living Well, we are interested in supporting men and their supporters to live fulfilling, active, engaged lives. Our focus moves beyond symptom management, towards enhancing overall well-being. This is why we have included a well-being assessment and tips for living well. 1BlueString asks guitarists to replace one of their six strings with a blue string to symbolize and support the 1 in 6 men sexually abused in childhood. Raise awareness and support by ordering your free kit today.